What is the White House Situation Room and why was Omarosa in it? Recording devices are forbidden in the SITROOM, but Omarosa says she has a recording of Chief of Staff John Kelly firing her. The White House Situation Room has been witness to many of the most critical events in recent U.S. history. President Johnson ran the Vietnam War from the complex in the White House basement. President Obama and his staff gathered in the "SITROOM" and watched on a TV screen as Navy SEALs killed Osama Bin Laden. Before the Trump administration, however, no government official had ever used the high-security complex to fire a former reality TV star. Larry Pfeiffer, who ran the security facility in the basement of the White House between 2011 and 2013, says he found many things about ex-Trump aide Omarosa Manigault Newman's account of being fired by Chief of Staff John Kelly surprising, but none more than how one of the most sensitive spaces on U.S. soil was used for such a mundane purpose. "In my two years at the SITROOM, I don't ever recall a personnel meeting taking place in that room," said Pfeiffer, who worked 32 years in the U.S. intelligence community, including as chief of staff for CIA Director Michael Hayden. "On one level, I'm flabbergasted, but on another level, with this administration, nothing surprises me." The SITROOM, said Pfeiffer, is "more than a little room." 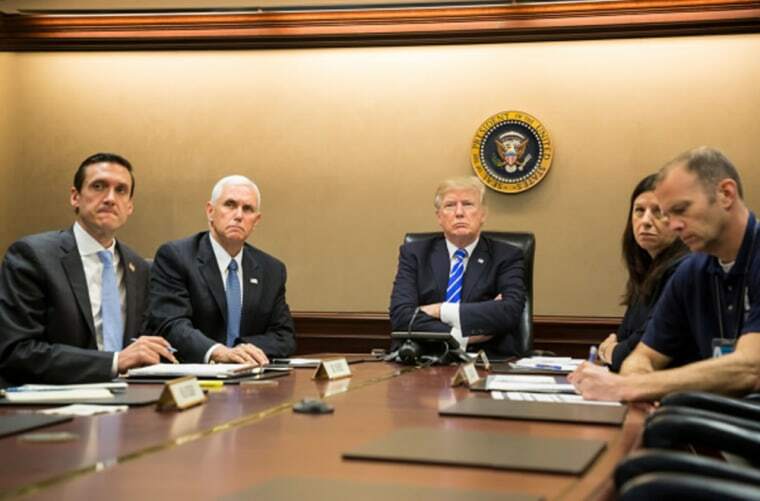 In fact, the Situation Room is many rooms — seven, depending on how you count — and at more than 5,500 square feet is the largest contiguous space inside the executive mansion. It is not a bunker, and despite its basement location has some windows, but security is stringent. Every visitor is screened and access is closely controlled by a staff that works 24 hours a day seven days a week. The physical space that would become the Situation Room began life in the FDR administration as an open courtyard that was gradually covered over. In 1947, while Harry Truman was president, part of it was converted into a bowling alley. In 1961, after the Bay of Pigs, JFK decided he needed a single space to coordinate action during crises. The Situation Room was born. Forty-five years later, during the George W. Bush administration, the complex was gutted and renovated, its wooden interior walls replaced by high-tech material. The biggest room in the updated complex, the JFK Conference Room, is centered on a huge conference table and can seat 40. A second, smaller conference room is the space seen in a famous photo of Obama staffers monitoring the May 2011 U.S. raid on bin Laden's compound, while a third "breakout room" can hold about five staffers. The Situation Room is staffed around the clock in shifts with personnel pulled from the intelligence community. For these permanent staffers there are three tiny offices and the Watch Floor, the communications center that monitors the world for the National Security Council. Since its 2006 overhaul, it has also been used by the chief of staff's office, according to the White House Museum website. Neither Manigault Newman nor the Trump White House initially provided any details as to which room in the complex was the scene of her firing by Gen. Kelly, which Manigault Newman described in her new book, "Unhinged," and on "Meet the Press" Sunday. She also provided what she says is a recording of the meeting — though recording devices are prohibited in the SITROOM. The White House issued a statement condemning Manigault Newman that also appeared to confirm that the meeting had occurred in the Situation Room and had recorded. "The very idea a staff member would sneak a recording device into the White House Situation Room," said Press Secretary Sarah Huckabee Sanders, shows a blatant disregard for our national security — and then to brag about it on national television further proves the lack of character and integrity of this disgruntled former White House employee." On "Hardball" Monday night, Manigault Newman told NBC's Chris Matthews that the firing took place in the "president's conference'' room" — the JFK Conference Room — where she had previously attended a meeting on hurricane relief, and that Kelly had brought her down there specifically to fire her. Asked if Kelly took her to the basement to keep her from appealing personally to Trump to intercede, she said, "He did it on purpose. He wanted me isolated. He wanted me in fear." She said she was locked in the room and couldn't leave. Pfeiffer and two other former SITROOM officials said that historically the conference rooms were continually in use by National Security Council personnel or administration officials, and scheduling is very tight. During his tenure, Pfeiffer said, the complex was only used for national security discussions, with three exceptions: emergency meetings on the federal response to natural disasters, a couple of large group discussions on health care policy during the rollout of Obamacare; and a 2012 taping for a segment of the NBC News show "Rock Center" about the bin Laden raid. Pfeiffer said everyone who enters the Situation Room complex is well aware of the required security measures. In addition to signs at the entrance that tells guests they cannot bring electronic devices of any kind into the complex, every visitor is verbally reminded. "They are immediately met by reception, who gently tells them, put your phone, electronic devices in a box," said Pfeiffer. The list of prohibited devices is long and includes iPhones, iPads, Kindles, recording devices, even FitBits. Pfeiffer confirmed that there is equipment in the SITROOM that can detect electronic devices, but would not describe it. Two other former SITROOM officials said there are indeed detection sensors in the ceilings of the conference room and offices. If a device is detected prior to the start of a meeting, Pfeiffer said, a SITROOM officer will quietly remind the individual of the rules and take the electronic device. "If a meeting had started, we would pass a note to whoever was running the meeting and in every case, they sternly reprimanded the individual and in some cases, dismissed them from the meeting," said Pfeiffer. "Security was taken very seriously." In fact, Pfeiffer noted that anytime any foreign official was given a tour –"no matter how friendly"—the entire complex was "swept" for recording devices. Pfeiffer said he is unaware whether the sensors could detect all types of personal recording devices. Asked by Matthews how she had gotten a recording device past the sensors, Manigault Newman declined to comment.